This tutorial explains how to use a procedural cone to get flat disc effects for eye iris', planet rings and simple shockwaves. A primitive cone, with very little height, can do a few tricks by the nature of it's mapping. The mapping coordinates generated by a cone are like tapered cylindrical coordinates. If you have a cone with a height value of say 0.01, and then have a smaller value for Radius1 setting than Radius2, the cone sides become a disc, with virtually flat, circular mapping coordinates. 1. 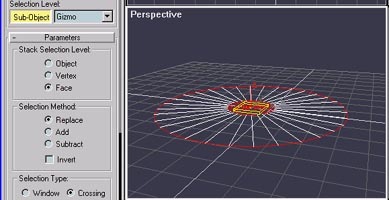 Create a Cone like the one described above, turn on "Generate Mapping Coordinates"
2. Add a Volume Select modifier and, in SubObject mode, from a top view of the cone, 2D-scale the Gizmo so it is inside both Radius 1 and Radius 2. 4. Add a DeleteMesh modifier, Animate the radii for the shockwave. A Cone has it's materials pre-defined as ID1=Top, ID2=bottom, ID3=sides. A Multi-Material with ID1 as black and ID3 as the colored iris map will give you near perfect iris mapping that will distort 'properly' when you change the pupil diameter (Radius 1 of the Cone object).